I am a dreamer. I take an idea and run with it till it explodes and fizzles out in about 3 days. This time, it started with a button - a button I refused to stitch on a shirt. I have always refused to stitch buttons or anything else for that matter. So long as I refused I was not caught up in the traditions and bindings that trap women into domestic hell/duty... no, not for me! To stitch a button a few weeks ago, would have been the death of my freedom of choice and then I chose... to stitch it! I can't tell you what a turn-around this was for me. It was revolutionary. I decided it was o.k to stitch that button not because I am a woman but because I wanted to. Wow, what a revelation that was. I did a decent job, or at least my fella said it's ok and he used to have to sew his buttons on in the army and yes, he did a mock impression of how they checked for correct level and position of the button... so because of his experience (and not coz he's a fella) I can give this a big tick and can now say I can sew on a button. I'm sure I could sew on a button before when I made a rag doll as a child (its head may have fallen off and the button eyes may have dangled precariously but it was definitely sewn) but as an adult sewing for practicality is a new arena. It got me thinking. Dangerous, I know, and so is the internet. My little skill of sewing on a button wet my appetite for something more... a hobby or a... CRAFT! I had a search on the internet as to what crafts actually mean and entail and discovered Kirstie Allsops collection of channel 4 programs. Wow! I can dream and dream and dream about lots and lots of projects except... I am a dreamer and therefore procrastinate rather than do. I thoroughly enjoyed the series and gave me plenty of food for thought and I am sure will be a huge influence on any future projects. It was actually a little you tube clip on how to make 'Kanzashi' that broke the spell. 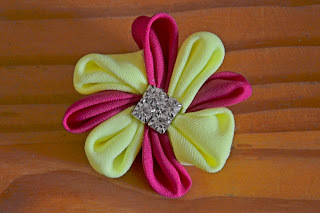 http://www.youtube.com/watch?v=s5OyjujqPE4 A little flower made from scraps of materials, folded and sewn to make a hair ornament. It was a perfect little project for me and my 11 year old daughter to try and together we had a really special time making it. It's nothing much but meant so much. This is what it's about. Breaking the spell of NOT doing. Not doing because I might fail or do a crap job. Although I am reluctant, I am trying to break that trap and in little ways, I'm building up my confidence as a person that can do rather than can't. One of the massive crafts that I was unable to grasp as a child was crochet. AAAAAAAAAAAAH run away... even the word is scary giggle. So it was a challenge. If you had said to me 2 weeks ago that I would be crocheting I would laugh uncontrollably. So I decided I'd had enough of stopping myself and decided to 'give it a go'. I looked on the internet http://www.youtube.com/watch?v=eqca00LdmAc and found some you tube videos, watched them over and over again. When it came to buying the materials to be able to crochet, I was scratching my head a bit. What size crochet hook do i get and what wool? I went to my nearest sewing/wool/craft place and asked. I bought a really small hook at 2.5mm and a 4 ply cotton. I did a practise piece, managed to make the chains to start it off, did a single crochet (apparently an American stitch - in Britain it's a double crochet I've since learned) which was tighter than a gnats arse. Impossible. So I got myself a bigger hook at 4.5mm and tried again. I kept forgetting how to chain and ended up accidentally starting off latching on the cotton as if I was about to knit and then wondered why I couldn't remember how to make the crochet stitch... it eventually clicked and I had to take it all off the hook again and remade using a chain. Much better! I eventually made a wonky dishcloth which I have used. How chuffed am I! So, here I am a few weeks down the line and I am presently making an armchair arm cover for my sister which, if I'm honest, may or may not happen. I'm using a black 4 ply cotton with my 4.5mm hook and it is taking me aaaaages. My sister has 2 black leather sofas and she requires a 15 inch by 15 inch crocheted piece for each arm. I've nearly finished my first one and it's taking me all week at about 1 and half hours per inch. Looking a bit wonky too. Apparently it's a common mistake of not counting the stitches properly and including the final stitch on the row so I will be going vertically to make it up to the 15 inch needed. I should have got a thicker wool and then it wouldn't have taken half as long. The lesson of this story is... buy a decent size hook at 4mm plus and some normal sized or even thick wool when you first do crochet. I may only know 1 stitch but once I have finished the arm covers then I plan to learn the others and maybe even follow a pattern! I've joined a couple of craft and crochet sites and have already saved aload of patterns. Crochet has been cracked! I would never ever never ever crochet something for someone as a gift unless I was exceptionally gifted and it looked as if the angels had spun the cotton from the heavenly clouds themselves and sang a sweet magical song and so lifting the silken threads, dancing in the rainbows sparkling dew to form the chains and stitches. If someone requests an item, I will give it a go in the understanding that (1) it may not turn out to be what they expected and (2) it may not happen anyway. My daughter is mad on Sponge Bob Square Pants and on a crochet site someone has done a fantastic Sponge Bob angel so of course she wants me to make it. You never know, watch this space!